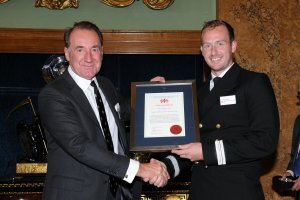 The crew of ‘Rescue 193’ from 771 Naval Air Squadron, RNAS Culdrose, was awarded the Edward and Maisie Lewis Award after battling treacherous conditions during a double rescue from two different ships in November 2015. They first went to assistance of the Irish Fishing Vessel Patrick after she reported an injured crewman requiring urgent evacuation after his arm was crushed in the vessel’s hydraulic winch. The crew, Lt Cdr Steven Hopkins (pilot and aircraft commander), Lt Philip Ross, (second pilot), Lt Jason Sawyer (observer) and CPO Aircrewman Mark Shaw (winchman), quickly made contact with the skipper and after many difficult attempts, the winchman was able to land on the vessel and retrieve the injured fisherman. 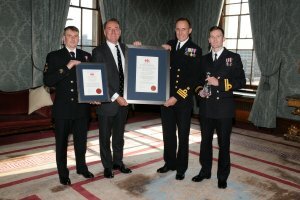 The crew of HMS CLYDE, the Royal Navy’s Falkland Islands patrol vessel, has been collecting the award after a dramatic rescue of 200 passengers following a major engine room fire aboard a 10,000 tonne Antarctic cruise ship. 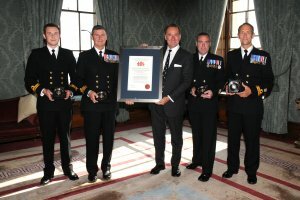 The crew of a Royal Navy patrol vessel has been awarded the Lady Swaythling Trophy after it battled harsh conditions during the rescue on Dolphin Cape, East Falkland in November 2015. Luke Hallis for his role in the rescue of Le Boreal. On arrival into one of the lifeboats, Luke immediately took charge and calmed the chaotic situation with firm leadership and steered the passengers to safety. 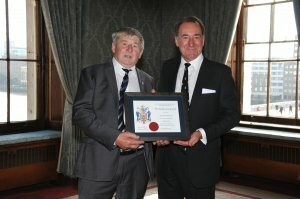 John Hunter, a leading member of the Lagan Search and Rescue (LSAR) Swimmer Corps, was given an Individual Commendation at the Society’s annual Skill and Gallantry Awards for his role in saving the life of a baby and recovering refugees from stricken vessels that were at risk of capsizing in the winter of 2015. Overall, the search and rescue mission saw LSAR volunteers actively involved in the rescue of 246 refugees in peril at sea or in danger of being shipwrecked. 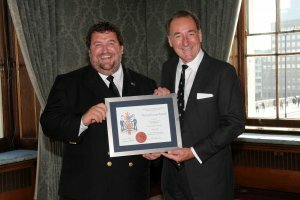 Brancaster: Cyril Southerland collected an award among Naval crews and a rescue swimmer, for his support of seafarers and their communities as an Honorary Agent of the Society. 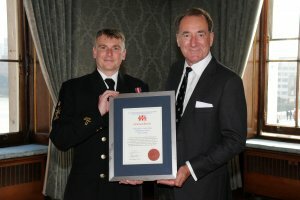 Lowestoft: Senior Superintendant Tim Jenkins of the Fishermen’s Mission collected an award among Naval crews and a rescue swimmer for his support of seafarers and their communities as an Honorary Agent of the Society.